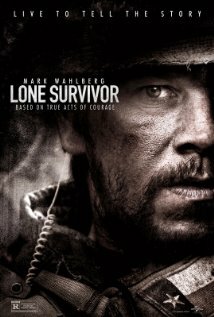 Lone Survivor – 3/5 – True stories are always one’s that are hard to capture on screen. There is always a middle ground to provide something entertaining but stay true to the nature of the story. This kind of medium comes into a deeper focus a lot more when it you make a military/war film. No matter what era the film takes place; war films are always one that must capture the heart of the moment, and strike a balance between action and emotions. Even if a film can combine the true nature of the story and with entertainment, it will strike an accord of very great accolades. Lone Survivor, a film based on a true story, gives you some gut wrenching moments, but still leaves clamoring for something more. Even so, this is a film worth the experience at the movies. Premise: Based on the failed Navy Seals mission “Operation Red Wings”; four members of SEAL Team 10 were tasked with the mission to capture or kill notorious Taliban leader Ahmad. What happens is strength of one man struggle to survive, even at the cost of his brother lives. These four actors do a great job in emulating how a Navy Seal is; showing how these guys work together as ‘brothers’ on base and on the battlefield. You see strength, purpose and focus; something that is common but surreal to see. There is a riveting sense to watching them in action, and you feel that throughout. Beyond the ‘navy seal’ aspect, they didn’t really provide any real strength to the ‘characters’, which causes you not to completely grip those ‘heart-pounding’ moments when deaths happen to 3 of the members. Even for this lack of depth, you still enjoy watching them on screen. When it comes to the rest of the supporting cast, you find a lot of generalities in them. You see common archetypes that you find in most modern ‘war’ films. You have the typical military support along with the cliché ‘terrorist’ of the 21st century. The one strength in the supporting cast was the villagers. They weren’t your cliché ‘aloof’ group you find in these kinds of films; they had decent depth and background for the situation. What these actors/actresses also did was show a complexion of a social structure that isn’t in the limelight. This added cultural influence adds an understanding that you may have not understood before. General setup of protagonist against an antagonist: The Navy Seals prepare for a highly classified mission to identify and take out a top terrorist leader in the mountains of Afghanistan. The inevitable mission: The four Seals set out in the mountains (with base support), leading to the village of the suspected terrorist. Their mission is compromised, and they must fight their way back ‘home’. The iconic deaths: Three of the four Navy Seals die from the fighting in either a stylistic ‘dramatic’ fashion or some ‘humanistic’ vision of bliss. The struggle for survival: The last Seal moves forward and struggles being left as the ‘lone survivor’ while finding a reason to live; with an unlikely ally. I will begin my analysis from this point. The reason I styled the first part with generalities is because, the film’s direction is just that; a simplistic toned directed film based around a ‘true story’ of a Navy Seal mission. This true story is something that has strongly affected many people; it is a story worth telling. Even if it is that kind of film, I still will judge it upon its merits of the overall context of being a ‘film’. When it comes to the first half of this story, you see it unfold just as mentioned above. When it gets to those ‘changing’ points between the linear thread, it is shown in a ‘dramatic’ fashion, without a decent buildup of any story or character development. This causes a conflict of entertaining value with emotional depth. A war/military film has to find that balance, and this one never does for the first half of its running time. You do have amazing sequences and ‘eventful’ moments, but you never get that feel that should be there. The one thing that keeps this part steady is the pacing; the film moves very quickly here, that you don’t completely dwell on the flaws for too long. Once the story gets to the single survivor, the film changes mood and eventually slows down to a character piece. Here, we are shown a more complex situation within the mission; when he is protected by an unlikely ally. Here, the film begins to exude a more ‘humanly’ induced theme; one that makes you feel some real purpose to this struggle of being the lone survivor of a death defying mission. Once it creeps to its conclusion, the film ends with an iconic memorable collage of the actually Navy Seals, something that brings great reflection of this story you just watch unfold. The cinematography is simply breathtaking. With the panoramic view of the camera angles of the whole environment (mountains, woods, village, etc. ), as well as a ‘close-up’ use for the gun fights, you feel as if you are there, watching all of it unfolding. The grizzled and dire situations are struck hard within, as the depictions of the moments are felt to be real. The score is very subtle, but the soothing of its simplicity helps create the tone for this ‘military’ film. Overall, Lone Survivor is a film ripe with many filming clichés and flaws, but it is still entertaining throughout its experience. Even in being an average film, it is a story that is endearing to see unfold. If you’re a fan of true stories or military films, this is one for you. You will enjoy it no matter what you go see.